Dali introduces Oberon speaker range from £350 | What Hi-Fi? Dali describes its new Oberon range, unveiled at IFA 2018, as "affordable audiophile speakers". Baby of the range is the Oberon 1 standmount design at £350, a compact bookshelf speaker with a 29mm lightweight, soft-dome tweeter and a 13cm wood fibre woofer to handle the bass and lower midrange frequencies. Next up comes the slightly larger Oberon 3 standmounter with an 18cm woofer and the same 29mm tweeter. The wood fibre mid/bass cone is a blend of fine grain paper pulp reinforced with wood fibres to give what Dali describes as a "stiff, lightweight and well behaved structure". 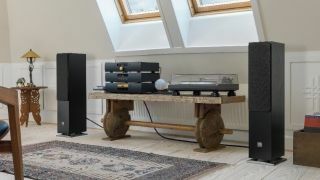 If you're in the market for a floorstanding speaker, Dali has two options here: the Oberon 5 (£700) and Oberon 7 (price tbc). They both use the same 29mm tweeter as the standmount models, but in the Oberon 5 you get a pair of 13cm wood fibre woofers, and in the Oberon 7 they go up to 18cm each. Should you want to put together a complete Oberon surround sound package, you can add the Oberan Vokal centre speaker which has a matching pair of 13cm mid/bass drivers and the same tweeter as the rest of the range. And for those who want something less intrusive, there's the option of the Oberon On-Wall model with an ultra-slim cabinet. All models are available in white, black ash, dark walnut and light oak. We are currently testing the Oberon 1 and 5 models so will bring you our verdict as soon as we can.